– the ESRs innovative research topic is particularly relevant for the uniqueness of the professional profile in the heritage sector. 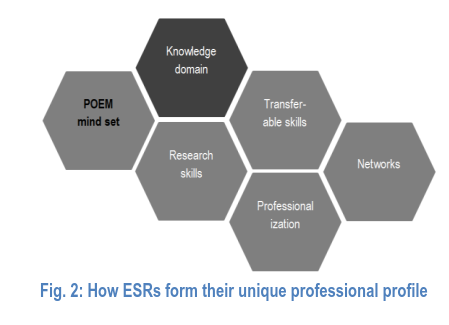 – learned from academic training, supervision, and mentoring provided by the excellent scholars of the POEM consortium and during secondments, moreover tightly knight for the ESRs particular needs in respect to the personal research topic (for more details see 1.3.). – will be provided for all ESRs research integrity and gender awareness by UHAM’s human resources development department during Knowledge Hub 1, further trainings of transferable skills in project management (first year), proposal writing (second year,) and job application trainings (third year) by local PhD programmes and career centres, who will also provide optional training courses according to individual Career Development Plans (CDPs). – networking with the consortium members and their organisations, representing a broad range of stakeholders in the heritage sector, furthermore getting involved in the networks and communities of consortium members such as Ashoka, Open Knowledge Foundation, Wikimedia and building up a network with the POEM members. – skills for managing future trends in the heritage sector learned in the particular POEM trainings provided during the knowledge hubs, enabling the ESRs for (social) entrepreneurial thinking, for an empowering organisation and management, for design thinking, for initiating collaborative knowledge production. The joint recruitment event, the Training Board and the start of the ESRs in month 7 will allow a collective and collaborative implementation of the training programme for all fellows. The network-wide joint POEM training programme will be organized in Knowledge Hubs, creating an environment of creative thinking as well as opportunities for exchanges, explorations, and networking across disciplines, sectors, stakeholders, and levels of PMW. Wikimedia Deutschland, the Open Knowledge Foundation Deutschland, Rachel Thain-Gray from Glasgow’s Woman Library, Daniel Schäfer from ICO moving bytes, the Centre for Social Innovation Vienna, and Prof Dr Silke Boenigk with her team of the Chair of Non-profit Management at the University of Hamburg, will provide unique training units that are at the core of their work for socially inclusive civil societies in Europe. Their training units will transmit relevant transdisciplinary knowledge and transferable skills for PMW related to the topics of open knowledge and collaboration, tool and data competence, media issues and literacy, organisational issues, and economic issues. It will boost scientific excellence and business innovation and to enhance researchers’ career prospects. 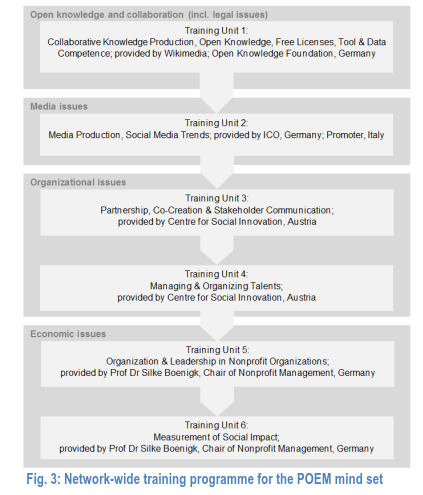 Each research fellow will have two secondments, which will expose them to two further work contexts beyond academia: institutional work in memory institutions, IT-business, creative industries, or the new sense of open, socially inclusive, empowering, social entrepreneurial PMW as it is lived in the non-academic organisations. The contrasting experiences and differences of the contexts will give reason to critical reflections about the nature of PMW, its challenges, premises, and practical conditions.